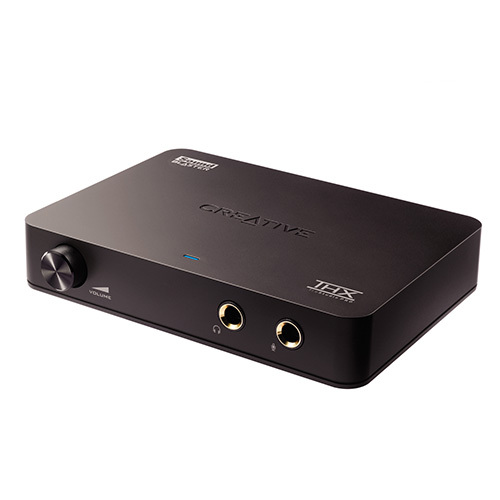 USB Sound Blaster X-Fi HD is an audiophile-grade sound system with premium connectivity for your Notebook or PC. 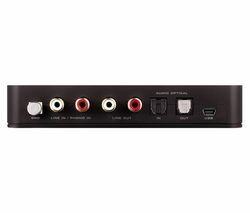 Premium USB Sound Blaster quality - Audiophile-grade components deliver unsurpassed USB audio quality with a signal-to-noise ratio (SNR) of 114dB. THX TruStudio Pro for unprecedented audio realism - Unique THX TruStudio Pro technology enhances all of your music, movies and games for maximum enjoyment regardless of your source material. 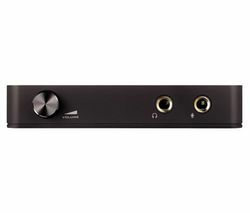 Direct recording from your turntable - Phono preamp with RIAA EQ allows direct connection of your turntable to conveniently convert your vinyl to CDs or MP3s. Superior headphone experience - High quality headphone amp supports studio-quality headphones (e.g. <=330Ohms). Convenient Connectivity - Gold-plated connectivity for maximum signal quality, easily accessible front-mounted headphone and microphone jacks with convenient volume control. AltoEdge recommends using this product with the NCH Software Audio Suite. Combine the best software with the best hardware to get the most out of your Audio Creation & Editing needs! Playback: 24-bit Digital-to-Analog conversion of digital sources in 24-bit with sampling rate of up to 96 kHz without audio monitoring. Recording:	24-bit Analog-to-Digital conversion of analog sources in 24-bit with sampling rates up to 96 kHz without audio monitoring.